Now for the first time, Serato Scratch Live users have the ability to use a custom editing keyboard without having to attach an external keyboard! 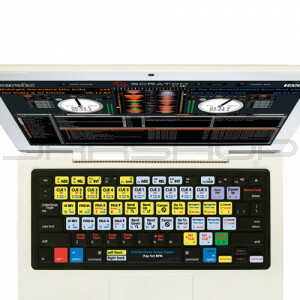 Serato Scratch users can simply put on our custom Serato Scratch keyboard cover and start editing faster…right away! With our exclusive Serato Scratch Editing Silicone Keyboard Covers, your Serato Scratch projects will get edited faster because you can spend more time working on your project and less time memorizing the Serato Scratch Live shortcut keys. Designed in conjunction with Deejaychoice (Kenny Styles P.)... Serato Scratch LIVE users can now play and scratch tracks faster with this custom designed keyboard cover. Each button is color coded to take advantage of Scratch LIVE’s extensive keyboard shortcuts for both the left and right decks including control and alt key combinations. The covers are made of durable, ultra-thin silicone and perfectly molded to fit both the Apple MacBook 13-Inch and MacBook Air. They are designed to not slip or slide and have a silky smooth feel so they are soft and comfortable to the touch and will not restrict typing. The Editors Keys Range of Serato Scratch Covers also safeguard your keyboard from dirt, spills and wear and tear,allowing you to protect your investment in your Apple MacBook or MacBook Air.